The presidential ambition of Dr. Olusegun Mimiko appeared dead on arrival on Thursday as the Nigeria Labour Congress, the registered owner of the Labour Party denounced the declaration. Mr Ayuba Wabba, NLC President and Mrs Ebere Ifendu, the National Publicity Secretary, Labour Party, rejected the declaration and the hijack of the Labour Party platform at a joint news conference on Thursday in Abuja. “It is not possible for Mimiko to run under the Labour Party and we want to say no to that as Mimiko has no business as a member of Labour Party. “ The party is registered by the NLC and the Trade Union Congress, Market Women Association, students. We register the party and the certificate of the party is with the NLC General Secretary. He added the Labour Party is not a place for any candidate to join when the condition is favourable and when you arrive at your destination, you abandon it. Also, Mrs Ebere Ifendu, National Publicity Secretary of the Labour Party also warned Nigerians and political aspirants to disregard the purported party convention slated for 13 September in Abuja. “It would be recalled that A. A. Salam was removed at the special national convention of the party held on 3rd October, 2017″. Mimiko made known on Thursday his intention to run for president of Nigeria on the platform of the Labour party (LP) in 2019. Mimiko, 63 years old, made the declaration at an event held at the national secretariat of the party in Abuja. He expressed concern over the killings in the Middle Belt and some other parts of the country. The aspirant said that the excruciating economic pains and the unprecedented level of division, and distrust at individual and communal levels, were of great concern. 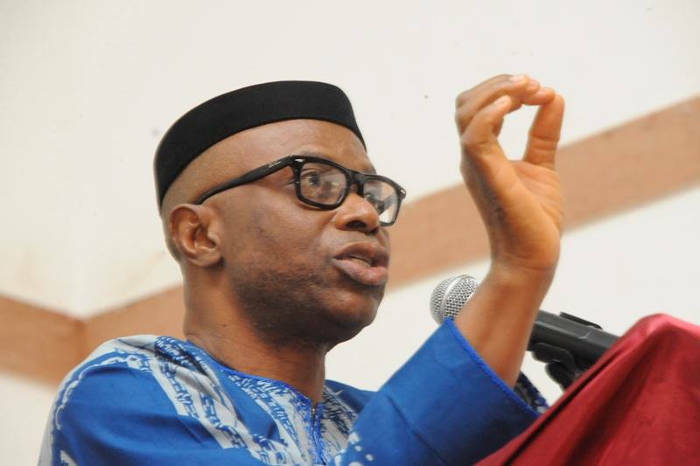 Mimiko said that the ability to envision great ideas, and demonstrable track record, rather than place and circumstances of birth, should be the most compelling basis for investing candidates with power. “This is, therefore, not the time to cheapen the dialogue by engaging in argument on whose turn it is to run the country. “There comes a moment in the life of a nation when every patriot must stand up to be counted. “At such a moment, no person worthy of a place in history can afford to remain ensconced in their comfort zone. “ When the totality of our being and the very essence of our humanity are in violation, patriots must advance to recapture the present; and commit to re-defining the future. Alhaji Abdulkadir Abdulsalam, who claimed to be the Chairman of Labour Party received Mimiko during the declaration. Abdusalam has now been declared an impostor by the NLC.